Since preservation of the built environment is inextricably linked with protection of the natural environment, LANDMARK WEST! is working to save our urban forests–the backyards, front yards and side yards of New York City. We are embarking on a three-track complementary strategy: to gather quantitative and qualitative data to demonstrate the environmental benefits of privately owned open spaces, to educate the public about the importance of preserving and using these open air jewels, and to advance public policy recommendations to preserve our back, side and front yards. First, we partnered with CUNY Insitute for Sustainable Cities (CISC) to answer a seemingly obvious question: how much privately-owned open space is there in the 5 boroughs? We learned that there are 108 acres on the Upper West Side alone, and more than 53,000 acres in the city as a whole. Click here for an open space inventory by borough. The goal of the CISC report is to investigate the role of increased vegetated land cover within urban residential yard spaces as a strategy for urban heat island (UHI) mitigation. Remotely sensed thermal imagery land cover data were used to analyze urban vegetation distribution and density and how they relate to temperature over the hot summer months. Our preliminary results show that the amount of vegetative cover IS positively associated with lower local temperatures, but further study will be needed to give us more finely localized data to tell us how backyard trees effect ambient temperature. Our Gotham Gazette article attracted the attention of WNYC’s Brian Lehrer Show, and LANDMARK WEST! staff member Evan Mason and CISC’s Bill Solecki appeared on the radio show in April, 2008. Click here to hear the show! 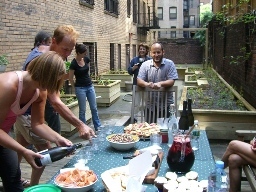 Over the summer of 2009, we partnered with NYC Soil and Water Conservation District and eDesign Dynamics, an environmental engineering firm specializing in water resources planning to “green” a back area on a paved Upper West Side back “yard” to generate data on stormwater detention. While it would have been preferable to remove the existing concrete, it was more affordable to place well-lined very large planters on top of the concrete with a trellis and benches to make the coop backyard–really a large alleyway–more attractive. Now, the area is providing real environmental benefits by diverting water from the water treatment system while it is providing a place for building residents to eat, sip coffee and socialize. We hope to inspire other private property owners to adopt cost-effective green infrastructure measures benefitting the entire city while making the area more aesthetically pleasing to the lucky few who get to enjoy it firsthand! Hidden behind rowhouses that line many of our urban side streets are hundreds of privately owned adjoining backyards which shape open air micro-environments. Existing studies that have focused on public open spaces and vegetation have found that trees and open spaces convey a range of environmental benefits to the surrounding environment but a detailed investigation of the environmental and economic benefits of privately owned open spaces and vegetation has not yet been undertaken. Reduce health care costs associated with respiratory illnesses, since trees reduce air pollution. We seek to inspire and educate, to encourage building owners and tenants alike to green even small sections of their property so that they can become a part of a sustainable urban infrastructure and these previously neglected spaces become places for residents to meet, relax and enjoy the open air! We aim to expand upon this website to publicize resources and provide useful links to assist the community as it strives to green private property. Eventually, we will have an on-line brochure and presentation materials to educate community residents about environmental strategies that are available, affordable and suitable to employ within the small scale back yards typical on brownstone blocks. This resource will be a nexus between science and community advocacy to ensure that the scientific findings will be available and useful to the community. Protecting the open space we have–both private and public–is essential if NYC is to be sustainable and liveable in the coming years. We simply can not afford to overlook the environmental benefits that privately owned back, side and front yards convey to the city, 365 days a year, 24 hours a day.